Dr. Shiguang Yu, assistant professor of immunology in the Arkansas Biosciences Institute at Arkansas State University, has been awarded a $1.7 million research grant from the National Institutes of Health (NIH). The research project grant program (R01) is the original and oldest grant mechanism used by NIH. The R01 grant is an award to support a specified project by an investigator in an area representing the investigator’s specific interest and competencies. It is the most esteemed investigator research award used by NIH and the most prestigious research award. This $1.7 million grant, which will be distributed over a five-year period, is designated for Yu to continue to study mechanisms leading to development of autoimmune diseases. 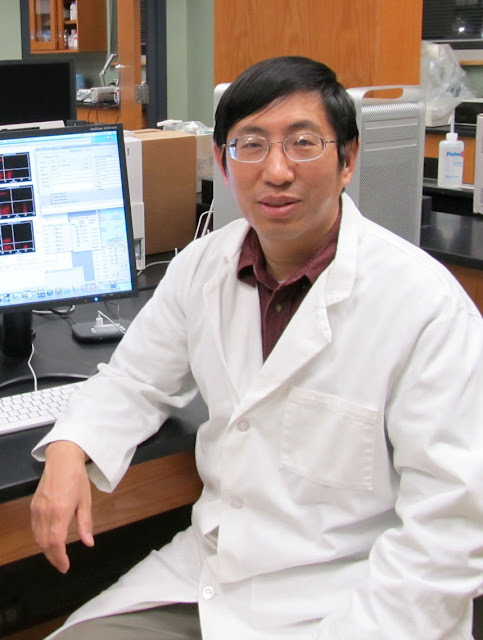 Dr. Jing Chen, is a co-investigator in this project. This is the first-ever R01 award received by A-State. Yu’s research is focused upon understanding how dysfunctional immune cells mediate autoimmune inflammation. The long-term goal of his research is to find novel therapeutic targets for intervention on autoimmune diseases such as multiple sclerosis. Multiple sclerosis is a chronic inflammation in the brain and spinal cord. There is no cure for multiple sclerosis. Current available clinical treatments have severe side effects. Using a mouse model for human multiple sclerosis, Drs. Chen, Ulus Atasoy (University of Missouri) and Yu previously demonstrated that a protein called HuR promotes a subset of pathogenic immune cells (called Th17 cells) to induce inflammation in the central nervous system (CNS). Specific depletion of HuR in immune cells reduces the severity of inflammation in CNS. The aim of the current project is to further understand how HuR controls target protein expression in pathogenic immune cells that cause multiple sclerosis. Approximately 23.5 million people currently suffer from autoimmune diseases and the prevalence is increasing. Autoimmune diseases arise from an overactive immune response of the body against substances and tissues of its own, mistaking them to be infections. Currently available immunosuppressant treatments for these diseases lead to devastating long-term side effects. Understanding the role and mechanism of the action of immune cells, specifically T lymphocytes, in autoimmune diseases can lead to developing appropriate treatments for these diseases. T helper 17 cells (Th17) are major contributors to several autoimmune diseases, including multiple sclerosis. Yu’s goal for his research is to understand how Th17 cells are driven to lead to the pathogenesis of autoimmune inflammation by cellular mechanisms such as Th17 cell regulation by RNA-binding protein HuR because HuR regulation of Th17 appears to lead to autoimmune disease. When such regulation was prevented in mice with transplanted HuR KO Th17 cells (HuR-/- Th17), in which HuR Regulation of Th17 was absent, the mice showed a delayed onset and reduced disease severity of experimental autoimmune encephalomyelitis. This is a mouse model of multiple sclerosis. Such information is essential for the development of new therapeutic interventions/drugs to treat autoimmune diseases induced by Th17 cells. Yu’s research is relevant for public health because Th17 cells are pathogenic (disease-producing) in several autoimmune diseases, including multiple sclerosis, rheumatoid arthritis and inflammatory bowel disease. In-depth studies of the mechanisms underlying HuR regulation of Th17 cells for promoting development of inflammation are necessary. Such information is essential for the development of new therapeutic interventions concerning these autoimmune diseases. Yu will involve undergraduate and graduate students at A-State in his research to perform cell and molecular biology experiments pertaining to this study, thus providing A-State students opportunity to perform research learning cutting-edge techniques to help treat in the future autoimmune diseases.